Many automation project requires communication with Host-Link(Omron). You can use Host-Link(Omron) ActiveX with is flexible structure in your projects as a Host-Link(Omron) communication interface. Host-Link(Omron) ActiveX is sold with company license. License owners can use this Activex without limitation. At Host-Link(Omron) ActiveX, .NET Framework 3.5 is used. This ActiveX has a very high communication speed. Thus you can finish your project’s all operations about Host-Link(Omron) in a couple minutes. Gets or sets the component’s PC Data Bit. 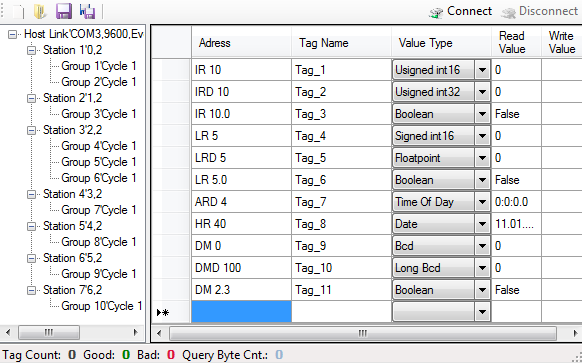 Following line sets the component’s PC Data Bit. Following line assigns component’s PC Data Bit value to variable “i”. Imports existing Tag List to component If your application project contains more than one Host-Link Component or there are another Tags in the project. Checks tag names for being unique with the component’s and given tags. The parameter that passed to this method is varies according to being component NET or COM.